Elite Shooting Sports is NOT affiliated with any other range, philosophically, financially, or otherwise. ELITE SHOOTING SPORTS is the lifelong ambition and passion of Greg Wodack, a competitive shooter for over 30 years. He is an IPSC Grand Master and IDPA Multi-Gun Master. From 1997 to 2000, he was ranked in the top twenty of open Grand Masters in the world. Greg has multiple law enforcement and civilian instructor certifications and has shot and taught on ranges all over the country. 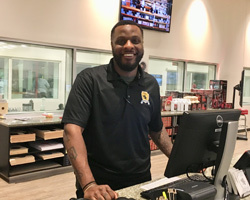 Greg is the former manager of the National Rifle Association (NRA) Headquarters Range, one of the busiest indoor shooting ranges in the country. During his 15-year tenure at the NRA, Greg was awarded a total of six outstanding achievement awards, including the prestigious Executive Vice President's Excellence Award, the highest honor given to an NRA employee. Greg is involved in range consulting all over the United States. Across the country, he is well-regarded as one of the leading experts in building and successfully operating an indoor shooting range. Additionally, Greg has worked as a subject matter expert for a variety of companies and television shows, including some of Hollywood’s most well-known production companies, such as Jerry Bruckheimer Films. In his free time, Greg loves spending time with his three daughters and is very passionate about bowhunting. 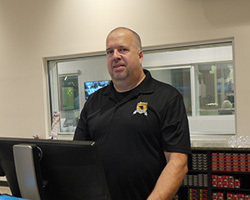 Vince is the Chief Range Safety Officer/Instructor at Elite Shooting Sports. 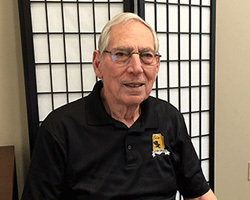 After a distinguished career in the United States Navy, including as a member of the USN/NAS Shooting Team, Vince worked with a variety of high-level companies, holding a top secret clearance for over 30 years in the field of complex electronic systems design, development, and testing. Vince is a certified Firearms Instructor, Training Counselor, and a Virginia Hunter Education Instructor. 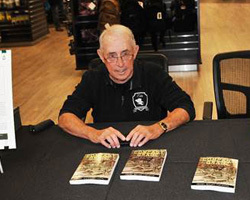 As part of the NRA’s Range Team, he was actively involved in the opening of the NRA Headquarters Range - from concept through construction to operational status. After 17 years with the NRA, 15 of which were with Greg Wodack, Vince left the NRA to help Greg with Elite Shooting Sports. Vince wears a lot of hats here at Elite - from Instructor development to official photographer. When he is not instructing, you can usually find him with his camera among the customers, making sure everyone is staying safe and having a good time, while providing us with some really awesome photos of all the action at Elite Shooting Sports. Paul is the Managing Director with more than 20 years of experience serving, managing, and instructing in the military, security, and law enforcement communities. For the last 13 years, Paul has worked at OMNISEC International, including his last role as Director of Training and Compliance, where he led certified training academies nationwide and cadre responsible for more than 500 classes a year. During his career, Paul was qualified in many specialized disciplines such as SWAT, Sniper, Anti-Terrorism Diver, etc. He is Master/Senior Instructor or armorer for many entities such as the Virginia DCJS, Maryland State Police, ASP, Monadnock, Smith and Wesson, Benelli, Barrett, Colt, Stress-Vest, Sig Sauer, Heckler & Koch, Glock, Beretta, Remington, and the NRA Law Enforcement Division. Paul enjoys spending his free time outdoors with his family, hunting with his daughters, and volunteering as a firearms instructor for the Boy Scouts, 4-H, and as a Virginia Hunter Education Instructor. Natalia is the Executive Administrator here at Elite Shooting Sports. She does a lot of the behind-the-scenes IT work, including our point-of-sales system, custom software programs, inventory management, and social media/marketing. Natalia occasionally works as a Range Safety Officer and helps at the Customer Service desk. She is an Instructor in our Ladies Only Basic Pistol Course and a certified Force-on-Force/Shoot House Instructor. Natalia loves to shoot and is quite often found on the range during her off hours practicing with her Glock 17 and AR-15s. She has the uncanny ability to pick up ANY firearm and drill the center out of the bull's-eye with it. In her spare time, she enjoys hiking the trails of the Shenandoah National Park and skydiving. 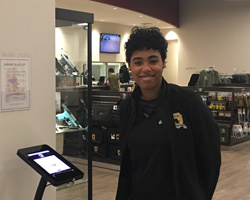 Alexa manages the Café at Elite Shooting Sports. 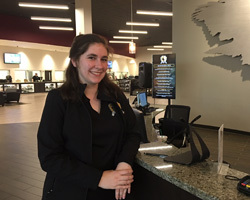 She is responsible for ordering and stocking a variety of goods sold at the Café, as well as arranging catering for groups and special events held at our facility. Additionally, she is responsible for the entire Café budget, marketing, supervising, scheduling, and training of the staff. In her time off, Alexa coaches the current state champion competition cheerleading squad and is going to school for Herbal Science and Holistic Medicine. Cindy is our Customer Relations Manager. She retired from Fairfax County after 28 years of service. Most of her career, she served as a police dispatcher, fire dispatcher, and 9-1-1 call taker. 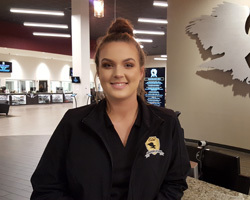 Ending her career as a Communications Operations Supervisor, she joined our team at Elite Shooting Sports one year later. Among her many duties, Cindy oversees our Customer Service Department, where she is often fondly referred to as everyone’s second Mom. She is the primary point of contact for our customers, ensuring all of their needs and special requests are met. Additionally, Cindy is responsible for answering e-mail and phone inquiries, organizing corporate and group events, as well as the development and implementation of customer service policies and procedures. We are very fortunate to have Cindy take care of us here at Elite. Amanda is the senior member of the Customer Service department. She is an Instructor in our Ladies Only Basic Pistol Course, Youth Rifle Program, Intermediate Pistol Course, and a certified Force-on-Force/Shoot House Instructor. Most folks recognize her as the first smiling face you see when you come in the door. Amanda came to us from the Fairfax County Court System after a career time-out as a stay-at-home mom. She enjoys spending time with her kids and shooting. 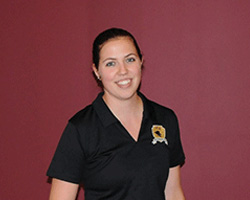 Amanda is passionate about instructing and truly enjoys helping students become better shooters. Jessica works in our Customer Service department. She is an Instructor in our Ladies Only Basic Pistol Course, Defensive Shooting Simulator Course, and Youth Rifle Program. In addition, she is a certified Force-on-Force/Shoot House Instructor. She took a career turn from working as a cosmetologist to coming to work at Elite after a happen chance meeting with Greg. In her free time, Jessica loves spending time with her two children and her family. Stephanie works part time in our Customer Service department and in the Café. She is an Instructor in our Ladies Only Programs and an adjunct Instructor in the Youth Rifle Program. Stephanie loves to work with customers in a private instruction setting, helping improve their skills no matter what their need. Outside of Elite, she enjoys spending time with her husband of 19 years and their four children, and is usually baking something from scratch. 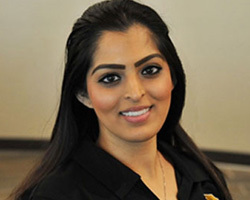 Noureen works in our Customer Service department and is an Instructor in our Ladies Only Basic Pistol Course. She enjoys shooting with her husband who is one of the region's up and coming nationally ranked competitive shooters. Noureen is no slouch when it comes to shooting either; she often outshoots her husband and doesn’t mind pointing it out to him. Charlene is a local native whose family has been in the Manassas area for generations. Her full-time career is as a Registered Dental Hygienist, but her enthusiasm for shooting brought her to Elite Shooting Sports. Charlene is our Marketing Specialist promoting the facility through social media, events, and networking. In addition, she loves showing new customers the ins and outs of the facility. She is a Primary Instructor in our Concealed Carry Course and Ladies Only Programs. In addition, she is a certified Force-on-Force/Shoot House Instructor. John is a part-time Range Safety Officer. However, as shown here modelling our muddy girl camo t-shirts for women, he is willing to do anything for the company. John is a combat veteran and Purple Heart recipient. 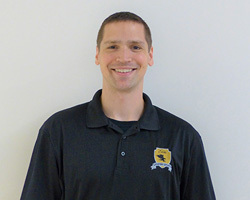 He finished his military career as a primary Instructor at Weapons Training Battalion Quantico, VA. John has multiple instructor certifications and is proficient with just about every weapons platform. Jeff is the Range Operations Supervisor, who is responsible for overseeing the day-to-day operations of the range. In addition, he is a Primary Instructor in our Defensive Shooting Simulator Course, Practical Carbine Course, Concealed Carry Course, Intermediate Pistol Course, and a certified Force-on-Force/Shoot House Instructor. Jeff is a former Army Ranger and a combat veteran. He is currently enrolled in several college courses and is working his way toward a degree in Criminal Justice. In his free time, Jeff enjoys trail running, swimming, and watching football. Katie is a local native from Nokesville, VA, and seems to know just about every customer that walks through our doors. She loves the outdoors and is an avid bow hunter. 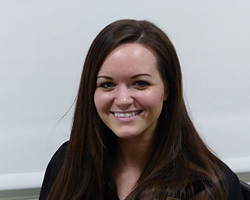 Katie is our Communications Specialist and an Instructor in our Ladies Only Basic Pistol Course, Intermediate Pistol Course, as well as a certified Force-on-Force/Shoot House Instructor. Katie occasionally; works as a Range Safety Officer and helps at our Customer Service desk. She loves shooting rifles in any flavor and has turned in some pretty incredible groups. She is equally proficient with her Glock 19. She enjoys spending her free time with her friends and, especially, her best friend Mini, pictured here with Katie at her desk. 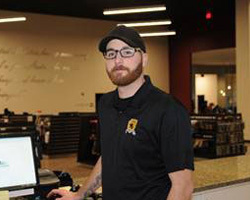 Zac is a Range Safety Officer and an Armorer at Elite Shooting Sports. In addition, he is the Lead Instructor in our Practical Carbine Course, a primary instructor in the Intermediate Pistol Course, and a certified Force-on-Force/Shoot House Instructor. 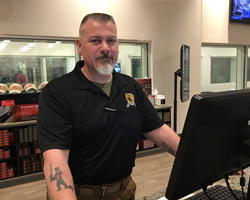 Zac is a combat veteran who came to us after three years as the senior firearms instructor at Weapons Training Battalion in Quantico, VA. Zac has multiple instructor certifications and over 2,500 hours of instructional experience. 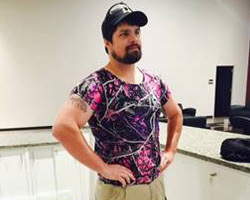 Zac enjoys competing in USPSA Matches and pretty much loves everything to do with firearms and the shooting sports. 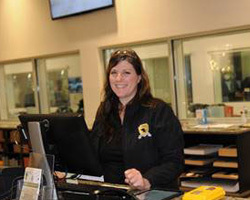 Stephanie is the Training Administrator at Elite Shooting Sports. She is at the core of all program and curriculum development, instructor development, and simulator-based training. Also, she is a certified Force-on-Force/Shoot House Instructor. 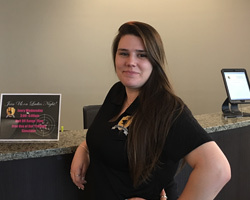 Stephanie has a passion for instructing, and when she is not teaching students how to shoot, she teaches ballroom dancing and horseback riding in her off hours. Kevin is a full-time Firefighter for Fairfax County. He works part time at Elite Shooting Sports as a Range Safety Officer and an Armorer. He is a Primary Instructor in our Practical Carbine Course, Concealed Carry Course, Intermediate Pistol Course, as well as a certified Force-on-Force/Shoot House Instructor. Kevin trains as hard with firearms as he does as a firefighter. His enthusiasm for the shooting sports is contagious. As a member of the Elite Shooting Sports' official shooting team, Kevin enjoys competing in USPSA Matches and loves everything that involves firearms. In his spare time, Kevin is an active member and leader of his church. 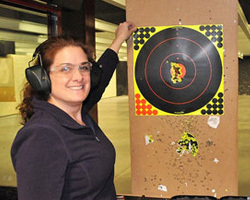 Brooke is a Range Safety Officer and an Instructor in our Ladies Only Programs. She is a former NCAA Division 1 athlete and loves coaching volleyball. She equally loves training with her HK VP9. Kim works as a part-time Range Safety Officer. She enjoys training with her S&W M&P9. Michael is a full-time student. He works part time in our Café and helps with inventory management. Michael is the Lead Instructor in our Youth Rifle Program. Rocky has had a very distinguished career, and we are honored to have him here at Elite Shooting Sports as a Senior Instructor. Rocky has done it all: combat Veteran with two tours in Vietnam, his second as Company Commander; graduated with honors from the Department of Criminal Justice Academy; Fairfax County Sheriff’s Office retiring as Chief Deputy Sherriff; has multiple Instructor certifications; previously worked with Greg for six years at the NRA Headquarters Range as a Range Safety Officer and Instructor; and recently an author of his new book “Company Grade." Kaila floats between the Customer Service and Range Safety Officer. She is an Instructor in our Ladies Only Basic Pistol Course and Youth Rifle Program. In addition, she is a certified Force-on-Force/Shoot House Instructor. Although Kaila is fairly new to shooting, you can often find her out on the range practicing with her S&W M&P9. In her free time, Kaila enjoys spending time with her three children and going to see Batman movies. Todd is a Range Safety Officer/Instructor at Elite Shooting Sports. Also, he is a certified Force-on-Force/Shoot House Instructor. Todd is a former combat Veteran and marksmanship Instructor at Camp Lejeune, NC. He currently works full time as a site manager in the private security industry. Todd previously worked for Mr. Wodack at the NRA Headquarters Range as a Range Safety Officer and Instructor. He enjoys shooting his Walther PPQs (9mm & .45) and Spikes Tactical AR platform. In his free time, Todd enjoys hiking, swimming, and trying to visit every Civil War battlefield in the Northern Atlantic region. Nadja is a Range Safety Officer and an Instructor in our Ladies Only Basic Pistol Course. She enjoys shooting both pistols and rifles to include her concealed carry Glock 43 and her Colt 1911. Also, she enjoys spending time on the 100-yard range with her M1A. When not working at the range, she works full time for the Department of Corrections, Probation, and Parole. In her free time, she enjoys spending time with her family and her three German Shepherds. Her hobbies include wood working, refinishing furniture, schutzhund dog training, and working out. Matt is a Range Safety Officer. In addition, he is an Instructor in our Practical Carbine Course and a certified Force-on-Force/Shoot House Instructor. He has a degree in Criminology, Law, and Society. 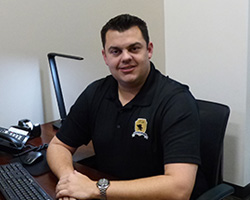 Matt interned at the Fauquier County Sheriff’s Office and is DCJS-certified. Currently, he works full time as a Deputy Sheriff for the Fairfax County. Sarah floats between Customer Service and Range Safety Officer. She is an Instructor in our Concealed Carry Course and both Ladies Only Programs. Also, she is a certified Force-on-Force/Shoot House Instructor. Born and raised in northeast Ohio, Sarah has had a 9-year career as a 9-1-1 dispatcher before moving to Virginia. She's currently finishing up her nursing degree. In her free time, she loves visiting her family in Ohio and enjoys going shooting with her husband and training with her Walther PPQ M2. Lindsay works part time in our Customer Service Department. She is a full-time college student majoring in Bio-Chemistry. She loves to do many things in her spare time, such as: painting, spending time outdoors, reading, trying new food, playing video games, and spending time with her pets, family, and friends. Also, she will never say no to a good cup of coffee. Halie is a full-time college student and private music teacher, who works at our Customer Service. She enjoys spending her free time with family and friends. 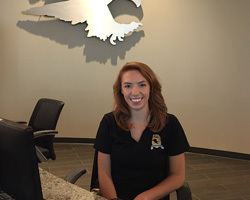 Lindsey is a Range Safety Officer at Elite Shooting Sports. Additionally, she is an Instructor in our Concealed Carry Course, Ladies Only Basic Pistol Course, and the Youth Rifle Program. In addition, she is a certified Force-on-Force/Shoot House Instructor. Born and raised in the hay capital of the world, Southeast Kansas, she grew up fishing and cruising dirt roads. Lindsey is a huge animal lover. She enjoys spending her free time doing arts and crafts and shooting here at Elite with her husband. Freya works part time in our Customer Service Department. Freya is a Reservist in the United States Air Force training to be a Geospatial Intelligence Analyst. 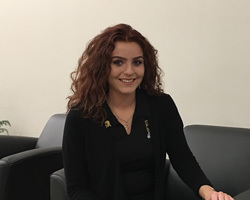 Currently, Freya attends George Mason University pursuing a double major in Psychology and Forensics, hoping to one day work as a Forensic Psychologist or continue on in the Intelligence. When Freya is not at school or work, you can find her training at the gym, hiking, or at her brother’s football field as one of the team medics. Diane works part time in our Customer Service department. Outside of Elite Shooting Sports, she is a Social Media Assistant for a non-profit association. Diane is a video game enthusiast and loves spending time with her dog Bowie. Phillip is a Range Safety Officer. He is a recent graduate from Muskingum University in New Concord, Ohio with a degree in Criminal Justice. He was a 4-year starter on the Men's Lacrosse Team and was a 3-year captain. One hobby that he enjoys is writing short stories in the fiction category and is currently trying to get some of his work published. 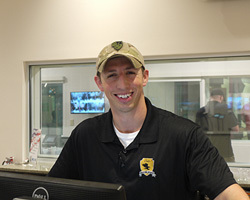 Sam is a Range Safety Officer at Elite Shooting Sports. In addition, he is an instructor in our Concealed Carry Course, Practical Carbine Course, and a certified Force-on-Force/Shoot House Instructor. 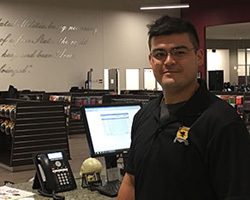 He has been in the firearms industry for over four years serving roles in sales, operations, training, and is a certified armorer. In his spare time, when not assigned to honey-do's, he is an avid Toyota 4x4 enthusiast, bow hunter, martial artist, and is interested in chainsaw art. Dale is a Range Safety Officer. Also, he is a certified Force-on-Force/Shoot House Instructor. Dale is a father of four and gun owner for forty years. He has studied martial arts and competed in sports car racing, a dozen years each. During off hours, he enjoys following sports car and motorcycle racing series, riding his sport bike, photography, grilling and smoking, shooting, and spending time with his wife, family, dogs, and friends. Brandon works part time in our Café. He is a full-time high school student and an aspiring soccer player, who spends most of his free time training. 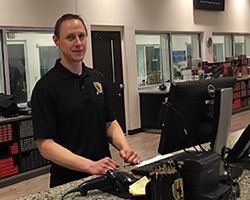 Kyle is a Range Safety Officer at Elite Shooting Sports. 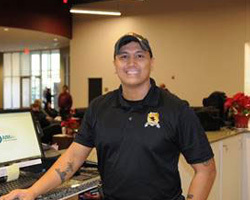 Formerly a member of the United States Air Force Security Forces, he currently serves as an Infantryman in the Virginia Army National Guard, pursuing any and all training available. In his off time, he enjoys hiking, going for a drive, and training with his custom AR15, 1911, and M1A. Robert is responsible for General Maintenance of the facility. 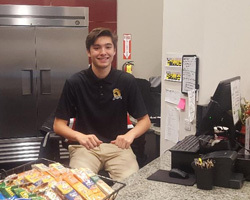 Outside of Elite Shooting Sports, he is a full-time student pursuing a degree in Cyber Security. Robert is an avid reader, generally leaning toward the historical fiction genre. He likes to spend his free time with his two constant companions - Shetland Sheepdogs - Smith and Wesson. Jake is a part-time Range Safety Officer. He is an avid outdoorsman and a Volunteer EMT. Jake can be found on his free time with friends, shooting his M&P and practicing archery. 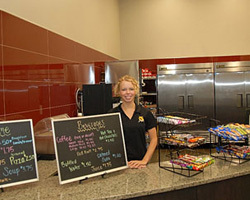 Marissa is a full-time college student and works part time in our Customer Service Department. Marissa’s entire family are regulars here at Elite Shooting Sports. You can’t help but see Marissa’s infectious smile the minute you walk through our doors. 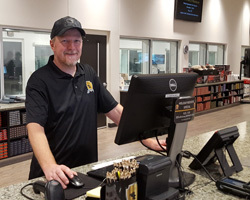 Curt came to Elite Shooting Sports in order to moonlight as a part-time Range Safety Officer with aspirations to become a firearms instructor. Curt is a quiet professional and life-long student, who enjoys learning new skills and regularly trains tactics and firearms. Sadly, he does not have a sense of humor but does enjoy picnics, sunsets, and long walks on the beach. Jay works part-time as a Range Safety Officer. 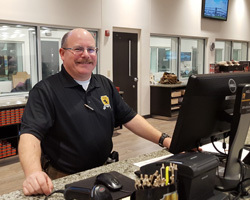 His full-time career is with the Federal Government for 26 years, but his passion for shooting and the exceptional customer service conveyed him to obtain a part-time position at Elite Shooting Sports. Jay is pursuing a Ph.D. degree in Organizational Leadership, examining the correlation between Emotional Intelligence and Organizational Commitment. In his spare time, Jay enjoys spending quality time with his wife of 24 years and their two fantastic boys who attend colleges in Alabama. In addition, Jay enjoys shooting his Glock 17, AR-15, and CZ Scorpion EVO 3 to improve his accuracy and gun handling skills. Alex is a full-time college student who is studying to become an elementary school teacher. She works part time in our Customer Service Department. In her free time, she likes to shoot and spend time with her friends here at Elite. David works part-time as Range Safety Officer. His full-time career is flying missions in support of operations in the Antarctic and Arctic regions as a C130 pilot. When he is not out flying, or spending time with his family, David enjoys just about any hobby he can get his hands on to include woodworking, biking, hand loading, and shooting his handguns, particularly his revolvers. Haley works part-time in our Customer Service department and occasionally as a Range Safety Officer. She is an Instructor in our Ladies Only Basic Pistol Course. She is a recent graduate from Liberty University with a degree in Criminal Justice: crime scene investigations and sociology. She plans to go into the background investigations field. In her free time, she enjoys outdoor activities, such as hiking, biking, or just hanging out with her family. Meghan is a full-time student and aspiring musician, and works part-time in Customer Service and our Café. She enjoys reading and writing, and the performing arts. Her hobbies include playing video games, making music, writing stories, and playing volleyball. Meghan is an anime enthusiast, loves K-pop, and enjoys watching TV dramas from other countries. She enjoys spending time with friends and family. Aidan works part time as a Range Safety Officer. He is currently in the United States Army Reserve as a Military Police Soldier. His passion is anything related to firearms, and he really enjoys shooting. Robb has recently joined Elite Shooting Sports as Chief Armorer. He previously worked for Virginia Arms since 2005 as an armorer and salesman. He is a factory trained armorer, certified by virtually every major firearms manufacturer. Robb has been shooting since he was five years old. His dad is a retired U.S. Marine, who was the Program Manager at Firepower Division, Quantico for the M16A2/A3/A4 & XM4. Robb got to shoot a lot of those military firearms while in high school, including lots of experimental arms sent to the USMC for evaluation. Immersed in the AR15/M16 platforms from a very young age, Robb has a shooting and working knowledge of the rifle that is rare, indeed. Robb has been hunting since his teenage years and working on guns since high school. He is a competitive shooter currently competing in IDPA and is classified as Master in IDPA and GSSF. In the past, Robb competed in a lot of 3gun, Steel Challenge, and USPSA competitions. Robb regularly attends firearms training classes as well as armorer courses. He has served five years as a Firefighter and EMT, and is a Notary Public as well. In his free time, Robb enjoys photography and flyfishing, and is a big movie fan. Taylor works in our Customer Service Department. She is a part-time college student, majoring in Psychology. She is a freelance make-up artist and has a passion for animals. Taylor enjoys spending her free time with her friends and family. John Paul is a part-time employee who works primarily in the café, but also assists with inventory. 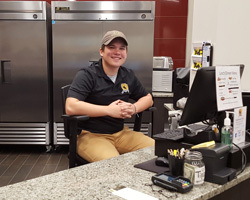 He is a full time student at Northern Virginia Community College, and his interests include fishing and cars. Sean works part-time as a Range Safety Officer. He is an avid shooter and shot his first firearm at 4H Camp, years ago. He loves to train, and when he isn’t, he prefers to spend his time exploring Virginia state parks with family and friends. Sean is a former Virginia Arms employee. He is a big movie fan (“The Last Dragon” is his favorite! ), and enjoys hunting and camping. Dwayne is a part-time Range Safety Officer. He works full-time in the customer service field. In his free time, Dwayne loves training with his firearm and is a huge Washington Capitals fan. Matt is a part-time Range Safety Officer. 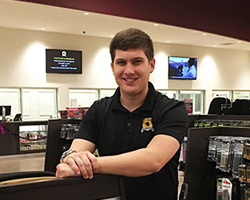 After spending 19 years working sales at Virginia Arms Company in Manassas, Matt’s face may be familiar to those who have been in the area for a while. A shooter since Boy Scout camp, many moons ago, he has spent 20+ years serving as a local and then federal Law Enforcement Officer. Since 2000, he has been an NRA-certified Firearms Instructor and assumed the same mantle to teach law enforcement Firearms and Use of Force starting in 2007. He enjoys shooting and collecting vintage firearms. Cait works part-time as a Range Safety Officer. She is a local native from Manassas and is a former Softball Division I athlete and coach. As a coach, she provided private lessons to young girls in order to improve their softball skills to make them more recruitable for college. 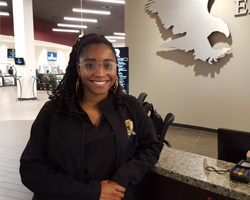 Before working at Elite Shooting Sports, she attended the Prince William County Criminal Justice Academy where she went through formal firearms training for police. 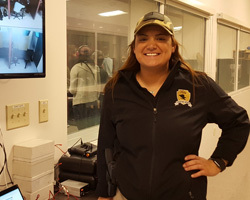 When not working at our range, she works full-time for the Prince William County Police Department. She carries a Glock 19 and loves to train every chance she gets. She is currently finishing up her last two classes at George Mason University towards her Bachelor’s Degree in Criminal Justice. Andrew is a part-time Range Safety Officer, and we quote, "I'm having a blast!" He enjoys shooting his CZs, FNHs, and 1911s. When he is not at the range, he likes to play paintball, video games, and ride horses. D’Lynne has been in the health and fitness industry professionally for thirty-two years. 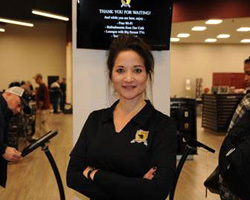 She has extensive experience in training U.S. Armed Forces and Law Enforcement, Professional and Olympic Athletes, Pre- and Post-Rehabilitation Patients, and regular training programs for civilians. Jae is a part-time Range Safety Officer. Outside of Elite Shooting Sports, he is a dedicated family man and father. In his spare time, he loves to cook, shoot, hunt, scuba dive, and build cars with his Dad. Jae is a huge fan of naps and watermelon! He is currently studying to become a Paramedic and looking to advance in his career with the government. 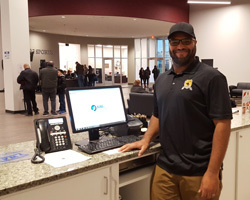 EJ works part time in our Customer Service department. Paulo is an Assistant Building Engineer. Sammie works part time in our Customer Service department.